Insignificant meaning – For the fainthearted . . . 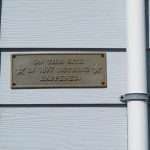 There is a plaque at the corner of a building at Noyo Harbor. Someone who lives there has a sense of humour, or, perhaps, a sense of annoyance at the alleged historical significance of numerous other buildings. 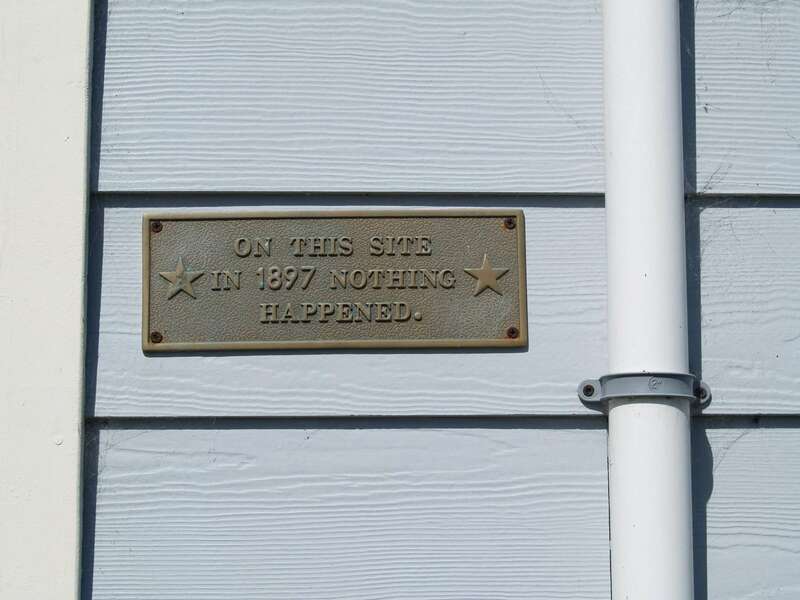 “On this site in 1897 nothing happened” it declares to the casual passer by who might stop to read what it might say. Its declaration is an antidote to times when there seems a widespread desire to magnify to world significance every time and every place. The culture of magnification is most evident in the mass media; the 24 hour rolling news services on television are peopled by presenters and correspondents intent on convincing us that every development in every trivial story is something demanding our full and undivided attention. The lack of anything to report is in itself a matter of significance that must be conveyed to viewers with the utmost gravitas, ‘I am standing here outside the building where the arrival we had anticipated has not taken place. I have here with me an expert on the subject who is going to explain why he believes this has not taken place’. ‘In the everyday, everything is everyday,’ says Maurice Blanchot, ‘but in the newspaper everything is strange, sublime, abominable’. Newspapers, incapable of seizing the insignificance of the everyday, because their writers cannot deal with what is hidden rather than obvious, seize upon seemingly dramatic events, ‘replacing the nothing happens with the emptiness of a news item in which something happens‘. Insignificance has come to be perceived in as something dull and boring, as something in which people will find no interest, yet our everyday experience tells as that the things which most capture our attention are not the things that fill our television screens, but the business of life around us. Stories from our friends, our workplace, our neighbourhood are hugely more important to us than anything on a news channel or the front page of a daily paper. Real stories of ordinary people are far more significant in our daily existence than the ersatz news with which we are bombarded. 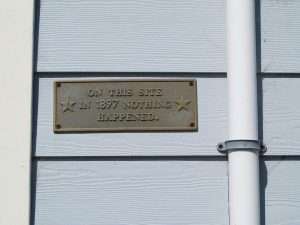 The plaque that declares nothing happened on the site in 1897 does not make the place dull, rather it becomes intriguing as to who might have put it up, what might have been their view of the world, what story they might have to tell. Nothing happening is sometimes more interesting than something happening. There’s another in Windsor Park, Devonport, Auckland New Zealand.